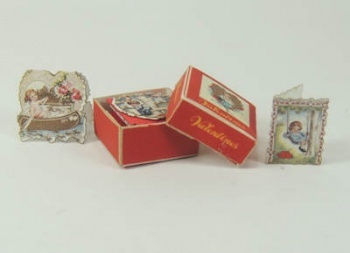 Copied from originals in my collection, these tiny little valentines are the simple fold type that children might have exchanged. They all feature charming illustrations, and measure 1/2" high. There are 6 cards, four different designs. They come with matching envelopes. The box will hold four cards and four envelopes and you get two extra cards to stand out for display. Super cute. All pieces are laser cut, so it couldn't be easier to put this darling kit together.